These figureheads are vivid reminders of the naval struggle of the 1821 Revolution and are also exceptional examples of Modern Greek woodcarving of the first 20 years of the 19th century. Continuing in the ancient Greek tradition of anthropomorphism in figureheads, the seafarers of the Revolution named their ships after ancient gods and famous figures of antiquity (ARES, SOLON, THEMISTOCLES, EPAMEINONDAS, etc.) and gave their forms to the figureheads that decorated their ships. Exhibited are the figureheads from the ships of A. Miaoulis, Tsamados, Bouboulina, Tombazis, Panos, Kriezis, Bambas, Hadjiyannis Mexis and that of the first steamship Karteria. 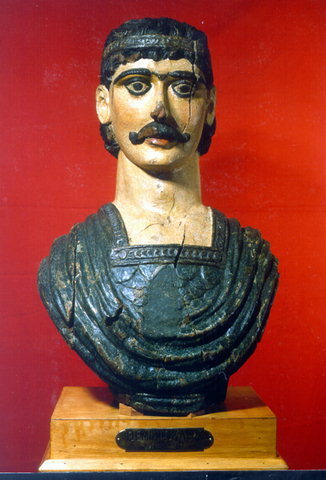 A figurehead with the form of Leonidas, from the similarly named vessel of Admiral Hadjiyannis Mexis of Spetses.